Prepackaged mini muffins. You know, the ones that come in that big box, and packed in individual little white pouches of three or four? They're filled with mini chocolate chips, speckles of (questionable) blueberries, or you might even find a double chocolate chunk flavor from time to time. Yes - those. Those little muffins happen to be a long time, not-so-guilty pleasure. Throughout my childhood, my older brother and I spent many weeks during the summer with my cousin, Lucia, in Philadelphia. Today Lucia, "Lou" and I are the best of friends and more so sisters than cousins. Some of the fondest memories from my childhood, are moments that the three of us spent together around her farm, spying on neighbors, going to the shore, and building forts in the woods. Along with our many adventures, I also recall the amazing food we often ate while visiting. If you're thinking "Philly - Philly Cheesesteak" well you are right, but as a sugar-enthusiast young kid, I didn't have much on my mind other than dessert, candy, and everything in between. It just so happened that my family had a very special spot right in their kitchen, known as the candy drawer. You better believe, as a six year old girl, that was the most important thing in my young life. Along with the enchanted drawer of possibilities, my Aunt was notorious for having the best mini bagels and mini muffins in the pantry whenever we came to visit. The first time Lou offered me my very own pouch of perfectly shaped, slightly moist as if they were fresh from the oven, and sugary sweet mini muffins, my muffin standard was forever different. Even though every bakery connoisseur is probably snubbing the heck out of this post, and will likely question my judgment from here on out, let me explain. Those little muffin-shaped imposters (not talking cupcakes), have some pretty sought after characteristics in the world of baking. They are light and fluffy but dense and incredibly moist. They are sweet and rich in flavor, without being too sugary or too sticky. They're not too dry, too bread-like, or too cake-like. They're good muffins. I wish I was being dramatic, but I have to say, I'm just being honest. I love everything about these muffins, and I love them more than some classic bakery style muffins that I've had in the past. So, long story short - those little snack muffin cakes are my inspo, and might always be my inspo when it comes to muffins. I want something sweet, flavorful, dense, and fluffy - all at the same time. I want each bite to resemble the last and leave you wanting just one more. Long story longer, this recipe is it. The best part - I only use wholesome ingredients, I don't rely on preservatives or fillers, and I managed to meet every one of my muffin exceptions. This recipe does not require refined sugar, you are more than welcome to substitute the whole wheat flour for a gluten free alternative, and feel free to replace the chocolate chips with dried fruit, or a handful of your favorite nuts. Thank you for listening to my longer than long story, and I hope you love these muffins as much as we do! Preheat the oven to 375 degrees and generously grease or line a muffin tin with parchment paper. Set aside. In a large mixing bowl, thoroughly mash three ripened bananas until they are smooth and lump-free. Add in two eggs, 1/2 cup of walnuts, and 1/2 cup of dark chocolate chips. Once the batter is combined, carefully stir in 1 and 1/4 cups whole wheat flour, cinnamon, baking powder and the dash of sea salt. This recipe is incredibly simple and can be made in one bowl. If you prefer to split the wet and dry ingredients, you are more than welcome to do so. Once the muffin batter is fully combined, scoop roughly 1/4-1/2 cup into each muffin tin. I prefer to use a heavy hand when pouring into the muffin tins for this recipe. The muffins rise slightly, but not enough to spill over. Optional: Top with extra chocolate chips or walnuts! Place the muffins into the oven and reduce the heat to 350 degrees. Bake for 15-20 minutes, or until the tops are golden in color. To ensure that the muffins have baked through, test the center by using a tooth pick - if it comes out clean, they are ready to go! 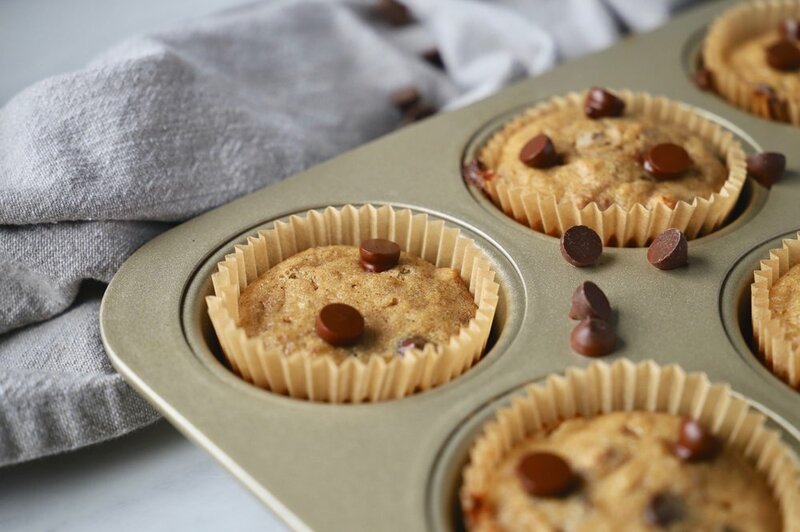 Let the muffins cool completely before serving and store in an airtight container for up to one week.